Enjoy the Music.com Internet Browser V11! 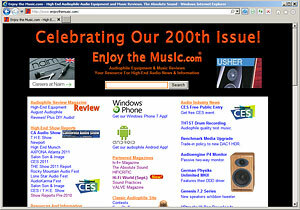 (August 15, 2011) Enjoy the Music.com, a leader in consumer electronics audio equipment and music reviews for approximately 15 years with over 200 magazine issues online, has released Version 11 (V11) of our free Internet Web browser. As a longtime and highly respected site for audiophiles, Enjoy the Music.com began offering the world's first Web browser back in May of 1999. With over a decade of experience in development and research, Version 11 (V11) further refines and streamlines our previous efforts with links to online consumer electronic equipment reviews, audiophile music reviews, many respected print magazines and a wide variety of online streaming and download music resources. We also offer links to hundreds of equipment manufacturers from all around the world plus over 150 consumer electronics show reports. As the Internet has revolutionized the way consumers receive up-to-date information concerning electronics, and recently in their ability to purchase high resolution music, it can be challenging to find specific information for audiophiles. This audience is growing at a staggering rate; with over one billions Internet users to date! Without a doubt the Internet is now the world's largest storage of knowledge and data. Enjoy the Music.com continues to play a key role in reaching enthusiasts worldwide that desire learning about the latest in high-end audio products. Since consumers need a browser to view the Internet, Enjoy the Music.com continues to be the industry's only site in giving its readership a customized version to suit their needs. "Version 11 of the Enjoy the Music.com Internet Web browser continues to extend our technology leadership within the high-end audio industry and joins our recently released Android and Windows Phone 7 mobile apps" said Steven R. Rochlin, editor of Enjoy the Music.com. "With each new browser release, Enjoy the Music.com has made Web surfing faster, easier and more secure. In addition, new links to consumer electronics manufactures, online music resources and other interests allow users to easily find what they are seeking. Many new links within V11 allow audiophiles to find information they may not have been aware of. In total, the Enjoy the Music.com Internet Web browser is perfectly suited for audiophiles all around the world and supports many languages."